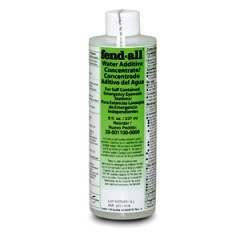 Fendall Water Additive also referred to as a bacteriostatic additive is a water preservative for the Fendall eyewash stations; Fendall Porta Stream l, Fendall Porta Stream ll, Fendall Porta Stream lll and other similar portable or gravity fed eyewash stations. Product is offered in a case of four 8oz bottles. Just mix with potable water from your tap and the treatment is good for up to four (4) months per 8 oz bottle. The solution has a shelf life of 30 months when unopened and can be used on eyewash stations up to sixteen gallon capacity.